A balance between freedom and safety is difficult for a community to achieve. With ResidentGuard, staff at Loretto Health and Rehab can rest assured they’re providing residents with the proper balance. 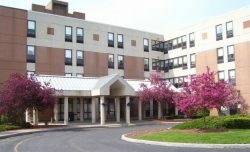 Located in Syracuse, New York, Loretto Health and Rehab is a long-term care community with nearly 600 beds and 150 post-acute beds. Loretto Health and Rehab had been relying on a 20-year-old wander management system with little flexibility. They were concerned about sacrificing safety in order to provide residents with independence. After implementing ResidentGuard in their facility, Loretto Health and Rehab saw a number of benefits. Employees found there was a reduction in false alarms and were able to respond to wander events discreetly because of alarm integration to smartphones. Loretto Health and Rehab had a positive experience transitioning to ResidentGuard from their previous system. Jack Pease, administrator at Loretto Health and Rehab shared, “Accutech and their local dealer, Special Care Systems took a consultative approach and went above and beyond in understanding our process and how their solution could benefit our staff and residents to the greatest extent.” Now, ResidentGuard has become a way of life at Loretto Health and Rehab. Employees pick up a pager/smartphone when they start and drop it off when they leave as part of their daily routine. Wander-prone residents can be extremely difficult to deal with, taxing already overwhelmed staff. With so many responsibilities, things happen—whether it’s an overlooked open door or a resident left unattended for a short time. Reliable wander management solutions lift some of that burden on staff, making it easier to monitor and care for residents. With ResidentGuard, Loretto Health and Rehab has been able to provide independence to their residents, while at the same time ensuring safety and improving quality of care. Interested in learning about how Accutech’s Residentguard system can benefit your community? Read the full case study here.